A Kansas grand jury handed down a 20-count indictment against the management of well-known water park company Schlitterbahn today, accusing the company’s leaders of a long string of criminal mistakes, incompetencies, and deceptions that all reportedly contributed to the death of a 10-year-old boy. The incident in question—which happened when a raft on the company’s record-setting Verrückt water raft ride went airborne, causing the child to be decapitated when his neck struck a series of “safety” bars suspended over the ride—happened in 2016, but, as the court documents make clear, the seeds of the moment were allegedly laid years in advance. As reported by the Kansas City Star, the indictment—which you can, and should, look through for yourself right here—reads like a slowly mounting horror story, as owner Jeff Henry, park manager Tyler Miles, and ride designer John Schooley (described as lacking “any kind of technical or engineering credential relevant to amusement ride design or safety”) apparently did everything in their power to make Verrückt a tragedy waiting to happen. Los Angeles Times correspondent Matt Pearce highlighted a number of the most chilling moments from the indictment on Twitter, including excerpts showing the ride’s rushed design and construction, secret failed bouts of testing, willful destruction of safety reports, and even an incident in which Miles allegedly sent lawyers in an effort to intimidate teenage employees from blowing the whistle on the park. For an extra helping of gut-churn, meanwhile, you can also revisit this glowing Grantland piece on the ride’s construction, from two years before the incident took place. 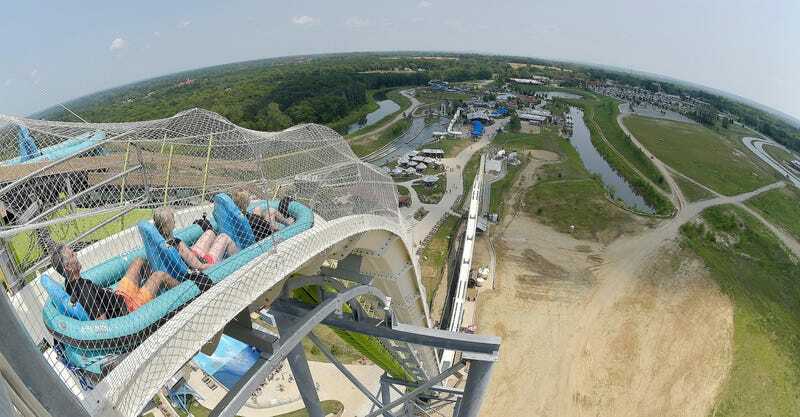 In it, Henry—described as a sort of waterpark visionary—jokes about the ride’s dangers, and makes it clear that he built it on a whim as part of a promotional stunt, in order to attract the attention of a Travel Channel show. Combined with the indictment’s mounting reports of injuries, maintenance failures, and cover-ups over the course of the ride’s lifespan—including a braking failure that went uncorrected for more than a week before its final, fatal performance—and it’s the real-world equivalent of a heavy dose of dramatic irony, as Henry openly gloats about design decisions that would ultimately lead to a child’s death. Honestly, it’s borderline supervillain stuff.